We have had spent many vacations at rented houses throughout Italy, and greatly enjoyed all of them. By far, this was the worse experience. The view was beautiful, but the house was very bare, even devoid of simple objects like working lamps. The owner neglected to mention that the second bathroom was OUTSIDE!! You had to cross a courtyard to reach it. Also, during our short stay, the stove ran out of gas, the electricity shut off for a half of day, and, probably most important to us, the wi-fi almost never worked. This was a severe problem, because one of our group had to submit blood work to her doctor in the US. Also, the kitchen was poorly arranged, with plates, pots and silverware thrown together in a closet. In addition, the house was located on an unnamed, single lane road which had two-was traffic. At night-time (as we were told by the locals) it was dangerous to walk or drive to town. There was a small beach nearby, but to reach it, one had to pass garbage on the trail. So, we left after one week (we had planned to spend two) and the owner told us that he would return the money for the second week. He did not. He has refused to answer texts and e-mails. My recommendation: find another place to stay. Otranto is beautiful, but a vacation can be destroyed by an unscrupulous owner. "The setting is fabulous and the location is terrific. We faced 2 problems: in May in the evening it was very cold with only one heater. The second toilet leaked and we called the owner twice and he never fixed it so it was unusable. We left a day early and he was going to refund a day but never did." "Absoltely lovely. Close to beach. Lovely historic building. Close to town. Helpful owner." Nous avons passé une super semaine 4 adultes et 4 enfants. Super petite plage à 200m Devant maison vu face à la mer magnifique. La wifi ne fonctionne pas très bien mais on est en vacances cela fait du bien. Accueil très sympa.A recommander. 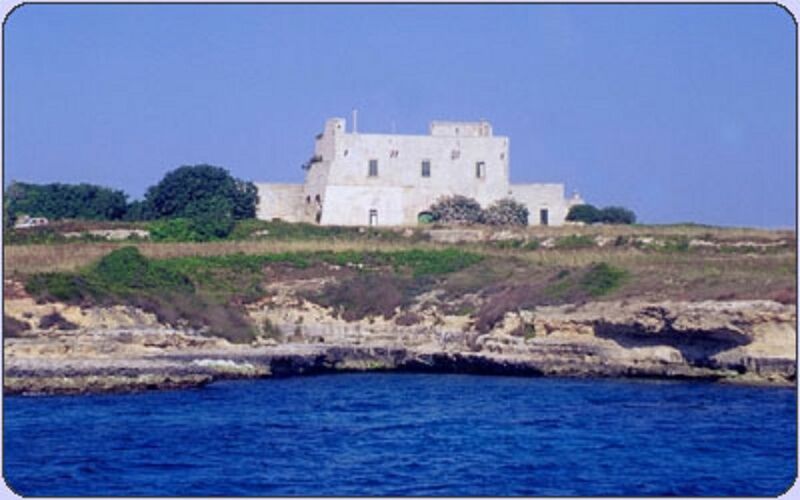 very cozy and near by bike or walking distance to all Otranto facility. It is is very the seaside and landscape around are amazing. The house is in a calm place even in full season and it is close to all the main attractions of the region. Nice outdoor area. Recommended for family and big group. You can live a truly glamour Italian experience. (Text automatically translated) Via the motorway to Bari, then follow the direction of Brindisi-Lecce. Once in the direction Maglie-Otranto in Lecce expressway. Via plane, Brindisi airport road then follow the same route. Accessop to the house by a private road with gate closed. Tariffe scontate in relazione alla durata, Tariffe in funzione del numero di persone, Richiesto supplemento per il riscaldamento in base alla stagione, Deposito cauzionale, Caparra richiesta alla prenotazione, Fornitura biancheria da letto, da bagno e da cucina € 10,00.